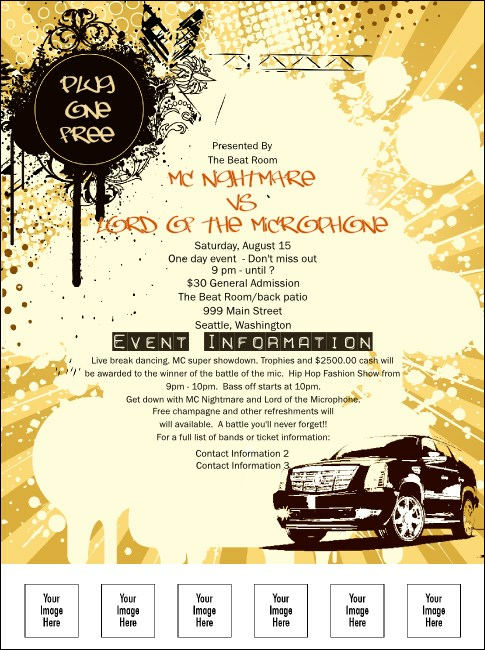 Grab attention for your event like an MC grabs the mic with Hip Hop Concert Flyers. Bursting with energy, a champagne-hued background pushes its black typeface to the forefront, showcasing your event’s information. Use the six image upload spots along the bottom to highlight sponsors, DJs, or performers. Measures approx. 8.49" × 11.46"
Serve up some seriously great event promotion with custom printed flyers from TicketPrinting.com.